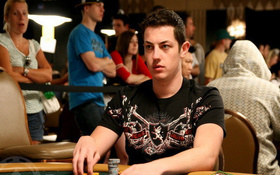 Although he promised to get back to business in his challenge match with Daniel ‘jungleman12’ Cates Tom Dwan can probably be excused for putting the match off a bit longer. According to a poster on the 2+2 poker forum regarding the high-stakes cash games that have been taking place in Macau, Dwan is up roughly $9 million in his challenge match against a wealthy Chinese businessman! David Benefield also posted saying Dwan was still down overall in the heads-up match. Benefield could be deflecting any IRS interest in Dwan’s performance in Macau with his statement, or it could be the spot-on truth. Since the results of the entire 10-days or so will never be known it’s next to impossible to determine who won and lost, but from the general vibe of the thread –from the posters who were on hand anyway– it seems Dwan did quite well without reading too far into their remarks. Players can read the extended thread (well over 100 pages) or the Cliffs Notes version (a mere 8 pages) on the 2+2 poker forums. This entry was posted on Wednesday, November 24th, 2010 at 7:06 am and is filed under Poker News. You can follow any responses to this entry through the RSS 2.0 feed. You can leave a response, or trackback from your own site.